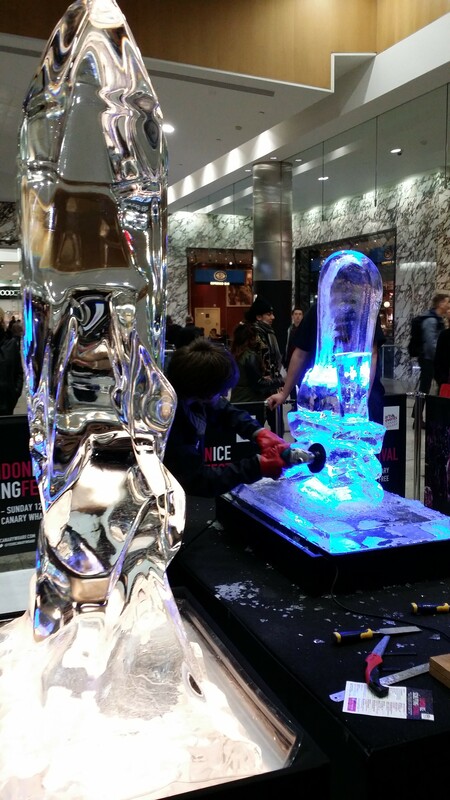 I went out to Marks & Spencers Simply Food this evening to grab some groceries on a quick run, and walking through the Jubilee Mall in Canary Wharf I came across the London Ice Sculpting Festival. They set up every year at this time, and I had seen the signs they’d be here but forgotten about it. There wasn’t any specific refrigeration going on that I could see in the mall, so I can’t imagine the pieces lasting very long. I often wonder whether ice sculptors find it depressing that there’d be an impermanence to their work, if they prefer that perhaps, or if they’re sculptors who work in different media and just choose ice on occasion for the challenge.